As Automated Vehicles (AVs) will be deployed in mixed traffic, they need to interact safely and efficiently with other traffic participants. 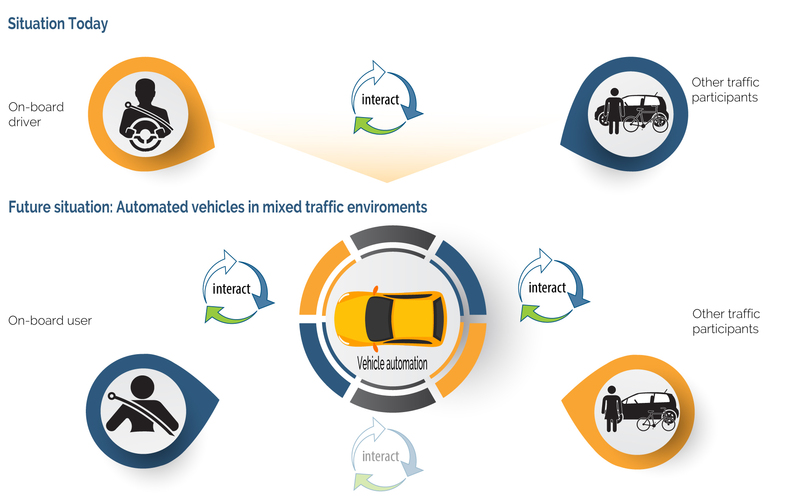 The interACT project will be working towards the safe integration of AVs into mixed traffic environments. In order to do so, interACT will analyse todays’ human-human interaction strategies, and implement and evaluate solutions for safe, cooperative, and intuitive interactions between AVs and both their on-board driver and other traffic participants. Across three European countries (Germany, Greece, & the UK), data will be collected about how human traffic participants interact in real traffic conditions. Specific situations will be identified to enable meaningful comparisons. This data will inform the development of interaction models that identify the main communication needs of road users in future traffic scenarios incorporating AVs. These interaction models will then be used to improve software algorithms and sensor capabilities for recognising the intentions of surrounding road users, and predicting their behaviours, enabling real cooperation between AVs and other road users. On the vehicle side, the AV itself will be controlled by a newly developed Cooperation and Communication Planning Unit that integrates the planning algorithms, provides synchronized and integrated interaction protocols for the AV, and includes a safety layer that is based on an easy-to-verify software with novel methods for fail-safe trajectory planning. In addition, the interACT project team will use a user-centred design process to develop, implement and evaluate novel Human-Machine Interaction elements for communicating with surrounding road users. interACT results will be demonstrated using driving and pedestrian simulators and two vehicle demonstrators.